© 2019 Preti and Sancassiani. Finsterer and Stollberger [1Finsterer J, Stollberger C. How do depressive mood or antidepressants acutely increase serum catecholamines? Clin Pract Epidemiol Ment Health in press ] raised several interesting points concerning the results of our research on Tako Tsubo Syndrome (TTS) [2Sancassiani F, Carta MG, Montisci R, et al. 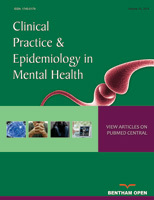 Takotsubo Syndrome is Associated with Mood Disorders and Antidepressants Use, not with Anxiety and Impairment of Quality of Life Due to the Psychiatric Disorder. Clin Pract Epidemiol Ment Health 2018; 14: 26-32. [http://dx.doi.org/10.2174/1745017901814010026] [PMID: 29541148] ]. With co-authors, we have already explained why we do not agree with most of them [3Sancassiani F, Carta MG, Montisci R, et al. The aim was about the association with psychiatric disorders not on the pathogenesis of Takotsubo. Clin Pract Epidemiol Ment Health in press ]. However, one point seems to us worthy of further discussion, that is the possible role of antidepressants in the etiology of TTS. Contrarily to what Finsterer and Stollberger [1Finsterer J, Stollberger C. How do depressive mood or antidepressants acutely increase serum catecholamines? Clin Pract Epidemiol Ment Health in press ] have intended, we did not state anything about the links between use of antidepressants and TTS. We have investigated the link since antidepressants are the most prescribed drugs in patients diagnosed with the Major Depressive Disorder (MDD). We found people with TTS had a greater chance of using antidepressants at the epoch of the TTS, but the odds failed to reach the statistically significant level after correction for comorbid MDD. As a matter of fact, several case reports have been reported of an association of TTS with antidepressant use [4Conrad SK, Catalano MC, Catalano G. The Use of Fluoxetine in a Patient With Takotsubo Cardiomyopathy. J Psychiatr Pract 2016; 22(3): 234-8. [http://dx.doi.org/10.1097/PRA.0000000000000151] [PMID: 27123803] , 5Nayeri A, Rafla-Yuan E, Krishnan S, et al. Psychiatric Illness in Takotsubo (Stress) Cardiomyopathy: A Review. Psychosomatics 2018; 59(3): 220-6. [http://dx.doi.org/10.1016/j.psym.2018.01.011] [PMID: 29544664] ]. Although a case report is not scientific evidence, the set of all case reports had to be interpreted in this framework. Moreover, immediately after the publication of our study, a review came out supporting the association between TTS and mood disorders, with a role for a link between TTS and antidepressants [5Nayeri A, Rafla-Yuan E, Krishnan S, et al. Psychiatric Illness in Takotsubo (Stress) Cardiomyopathy: A Review. Psychosomatics 2018; 59(3): 220-6. [http://dx.doi.org/10.1016/j.psym.2018.01.011] [PMID: 29544664] ]. Overall, we think that the doubts of the commentary authors as far as the role of the use of antidepressants in TTS seem outdated. Nevertheless, we concede to Finsterer and Stollberger that the data in so far is strongly suggestive but not yet exhaustive. However, we think that it is time to definitively clear whether the risk exists, what is the pathogenesis, and which antidepressants are more likely implicated. In fact, there are some antidepressants which more than others can potentially increase catecholamine’s level. We refer to SNRIs, for which a possible risk of inducing arterial hypertension has also been reported [6Carvalho AF, Sharma MS, Brunoni AR, Vieta E, Fava GA. The Safety, Tolerability and Risks Associated with the Use of Newer Generation Antidepressant Drugs: A Critical Review of the Literature. Psychother Psychosom 2016; 85(5): 270-88. [http://dx.doi.org/10.1159/000447034] [PMID: 27508501] ], and, as well, an increased risk of arrhythmia among elderly with previous cardiovascular events [7Biffi A, Rea F, Scotti L, et al. Italian Group for Appropriate Drug prescription in the Elderly (I-GrADE). Antidepressants and the risk of arrhythmia in elderly affected by a previous cardiovascular disease: a real-life investigation from Italy. Eur J Clin Pharmacol 2018; 74(1): 119-29. [http://dx.doi.org/10.1007/s00228-017-2352-x] [PMID: 29046942] ]. The prescription of these antidepressants in patients at risk of TTS should be carefully weighed against the risk of inducing a surge in the catecholamine tone and strongly monitored. It should be noted that these antidepressants are of the second choice in most of the guidelines with respect to SSRIs, acting only on serotonin, nevertheless, SNRIs have had a notable increase in the recent past. In patients with a potential risk of TTS, the use of SSRIs (however of the first choice) would be preferable because they are less able to increase catecholamine tone centrally and peripherally. Electroconvulsive Therapy (ECT) may be an alternative since the existence of acute cardiovascular risks has always been denied for ECT. However, several case reports had indicated a link of ECT with TTS, thus the use of ECT in patients at risk of TTS requires more detailed monitoring from now on. In conclusion, antidepressants might have a role in TTS, and prescribing an antidepressant to treat MDD in patients at risk of TTS is not without consequences.